Lately, I have been spending more time in the kitchen and concentrating on making healthy meals. My cookbook club has been an inspiration to me. Suddenly, I feel as if my cooking had become mundane and I found myself making the same things over and over again. So, I’m trying to mix it up a bit every week and give something new a try. 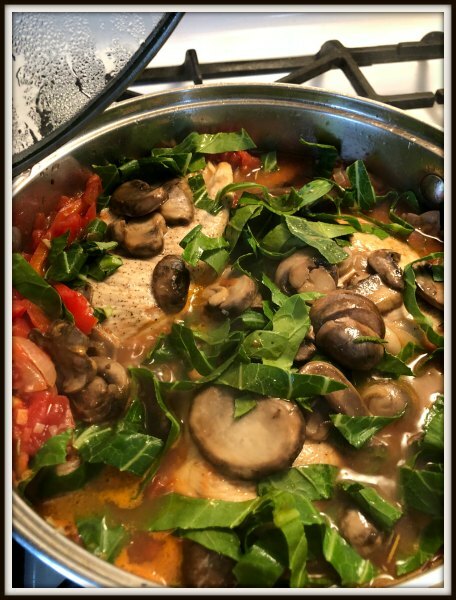 I found a recipe for a healthier version of Chicken Cacciatore and with some adjustments made it my own. I added more spices and more greens to make it a flavorful and complete meal. This does take some prep time so save it for when you can immerse yourself in the experience. I recently served this at a Sunday lunch and it went fast! It doesn’t taste even close to my mom’s version, but I can count my macronutrients in this dish while I can’t with hers. The colors alone scream health! Since I was serving a multi-course meal I prepped the chicken earlier. You ca brown the chicken on both sides and place it aside. I also prepped the mushrooms at this time and added them to the chicken I placed on the side. Later, I went on to complete the dish. The next few steps take about 30 minutes. Remember not to overcook the peppers as we want to see that bright red color! 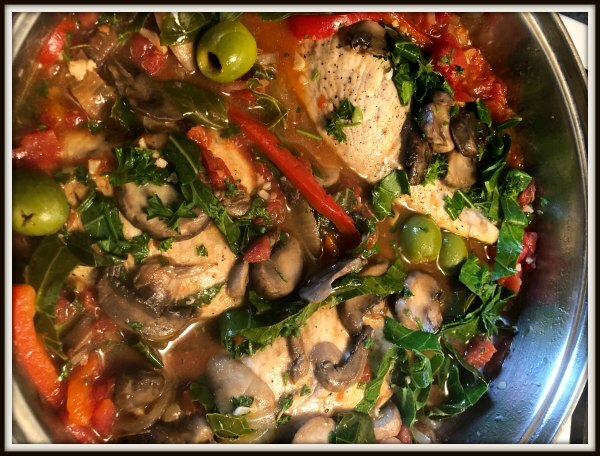 Easy stove-top version of a healthy chicken cacciatore. 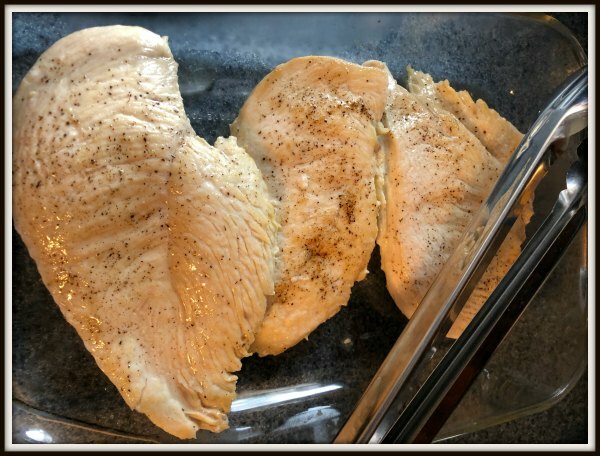 6 Boneless, skinless, Chicken Breasts. Heat oil on medium-high in a deep skillet. Season your chicken with salt and black pepper. Cook about 4 minutes on each side till browned. Remove and place on plate. Add mushrooms to the pan and cook about 4 minutes until brown and tender. Then plate with chicken. 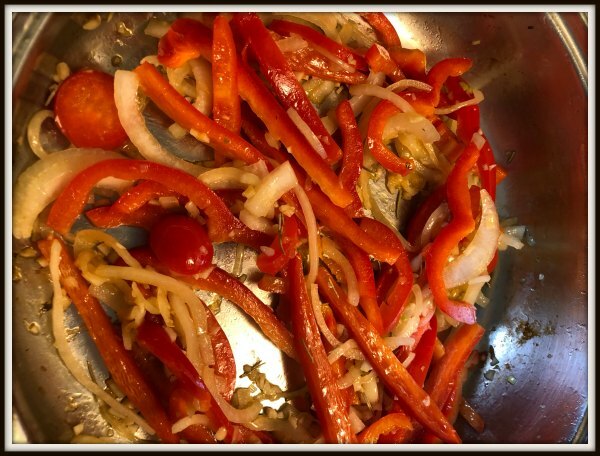 Turn the heat down to medium, add onions, peppers, garlic, and Italian Seasonings. Cook about 8 minutes and add wine. Cook about 3 more minutes till it reduces. Add your tomatoes with juice to pan. Add the chicken and mushrooms back in and simmer while covered for about 15 minutes. Next add in Collard Greens and crushed red pepper and cover again for another 10 minutes. Uncover, add olives and parsley. Stir and serve! Enjoy!!! Pin it and try it later! This looks so good. I would enjoy making this and pretty sure my family would enjoy eating it as well. Definitely adding this to my recipe book. I have never ever had Chicken Cacciatore. Crazy right? I certainly does look like a healthy and delicious dish though. Yumm this looks delicious. I never grew up with chicken cacciatore. And the chicken looks like angel’s wings in your post!! I’ve seen this on the menu at restaurants and haven’t tried it. I’m going to give it a whirl in my kitchen, now that you laid out all the steps! This looks like a great and healthy way to each this dish. I love stir fried vegetables so I’d like to try this as a veggie dish! This looks so healthy and delicious! I love finding new recipes and am definitely going to make this one soon. Oh wow that looks delicious! I love how healthy it looks and how colourful too! That looks amazing and definitely something that’s worth cooking. I love that it’s a healthy recipe that my husband and I can enjoy for lunch or dinner! Beautiful colors! So appetizing! This looks like a lovely healthy recipe to enjoy. I would switch the chicken out and still really be able to enjoy this. It would make a lovely dinner party dish. Oh wow this dish looks wonderful. They say you should eat a good range of colours so this must be super healthy as it’s lovely and colourful. Bet it tastes great too! This dish sounds good, I would love to try it out but will have to replace chicken with tofu, being a vegetarian. But it is absolutely delicious. Wow it looks so yummy. I’ve been looking for ideas for new dinners so thank you, as i never prepared it at home. What a super tasty looking dish. Makes for a great Friday night dinner, I guess i know what I will be having tonight then. Chicken Cacciatore is one of my favorites! Although I usually see it with tons of pasta. So this is a good change to have it look so healthy! This recipe looks delicious and it’s even better that it is healthy! This is so much better than pasta. I am making this recipe this weekend and sharing it with my mom too because I know she will love it! This looks amazing and I also love that it is healthy. Thanks for sharing! I loved this dish as kid and would love to make this for my family. 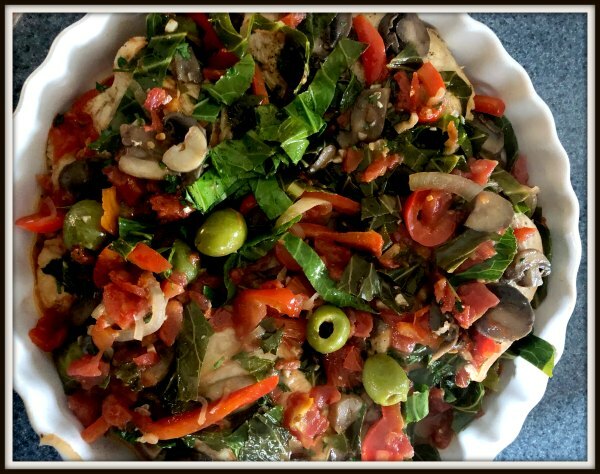 I have made Chicken Cacciatore before, but I would like to try this healthier version.